Have heavy traffic? This system has been rated to take over 120,000 pounds, standing up to the toughest traffic with ease while delivering easy access and strong performance for many decades to come. The locking lids in the frame and cover keep everyday tasks from turning into a preventable injury. Their covers lock open at 130º and can also lock at 90º for sewage inspection tasks. Manhole covers are heavy! 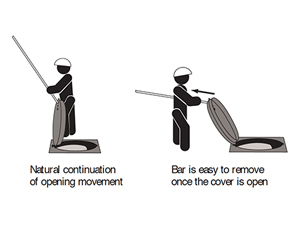 If you're tired of bending down to lift them, the covers are designed so that simply inserting a crowbar or common waterworks tool at 35º lets you just open the lid with a light pull while fully standing. Why make your crew lift heavy cast iron covers when they could just swing the cover up and out of the way? The strong hinges incorporated in the rings and covers use half the pressure, reducing workers comp claims while staying stress-free under traffic. 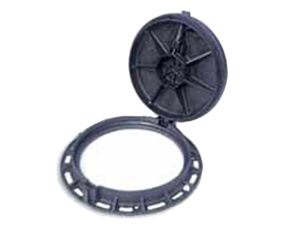 Are you tired of having your manhole covers going missing? Stop paying for expensive replacements when you include Pamrex's optional anti-theft cover lock, which is designed to work seamlessly with the entire system. The whole system is manufactured from only the strongest, toughest ductile iron, from the conventional key opening to the long-lasting frame. This reduces maintenance and improves lifespan, using half the weight to deliver four times the strength. 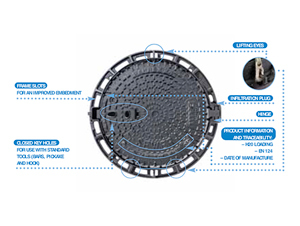 The elastomer ring has a burp feature to relieves system pressure while avoiding infiltration issues. At the same time, the solid hinges keep the lid stationary to prevent displacement. The bedding slots manufactured into the system allows whatever bedding material you're using to pass through, creating a stronger seal when paired with the chimney section. There are many benefits for using the Pamrex Ductile Iron Frame and Cover with your water utility, and Quality Water Products is more than ready to deliver the same strong, reliable customer service and support you've come to expect from us over the years. Why not take a look at everything the system has to offer? If you're not sure if it's the right solution for you, reach out today for more information, with any questions or to get a quote.